Mulayam Singh Yadav has only addressed three rallies in the Uttar Pradesh elections so far - two for brother Shivpal and one for daughter-in-law Aparna. Samajwadi Party patriarch Mulayam Singh Yadav, the 'star campaigner' of the party, has only addressed three rallies in the Uttar Pradesh elections so far - two for brother Shivpal and one for daughter-in-law Aparna. Although sidelined in the party, Mulayam has attached his personal prestige with the Assembly constituency of Lucknow Cantt and Jaswantnagar seats, being contested by his 'choti bahu' Aparna and brother Shivpal respectively. The 77-year-old wrester-turned-politician, who has grappled with many a political crisis, has been conspicuously missing from the UP poll cauldron in the first two phases. For the third phase polls on February 19, he has preferred to campaign only for his family members so far. The reluctant campaigner, in the changed equations in the party after his son Akhilesh Yadav took over, expressed in his three election meetings so far as to how important it is for him that the party wins these seats. "These elections are most important for me and Shivpal ... ensure his victory from here," the Yadav senior, who addressed two rallies for his brother, the sitting MLA from Jaswantnagar in party's stronghold of Etawah, had appealed. Starting his campaign for the UP polls, Mulayam had steered clear of any mention of SP-Congress alliance in his 30-minute speech in Takha block of Jaswantnagar. Similarly, in his meeting to seek votes for his younger daughter-in-law in Lucknow Cantt yesterday, he made an emotional appeal saying these elections are attached to his political respect and honour and he would be grateful to people if they supported his daughter-in-law. "We appeal to you to make Aparna win with a massive majority...our respect is attached to it. She is my daughter-in-law... Keep my honour and ensure her victory from the seat," he said. He promised to fulfil all promises irrespective of his party coming to power or not. "But if the party forms government, more works will be undertaken in a better way," he said, recalling the works done for women welfare, poor and labourers. Going all out to woo the minorities in the seat which has traditionally been a Congress stronghold, Yadav recalled how he managed the Ayodhya development when he was the CM and initiated strict steps to control the situation in 1990s. "It was for the sake of unity and integrity of the county that I had sacrificed my government," he had said. Yadav's preference towards Shivpal and Aparna is being considered as important in the Samajwadi Party as both these candidates are considered close to him and not too comfortable in the new regime in the party. Shivpal had been in the forefront of the tussle with his nephew and new party president Akhilesh Yadav and had also borne the burnt of the infighting after being divested of his ministerial posts as also his state SP president post. Among the three main decisions taken in the SP's emergency national delegate convention here on January 1 was removal of Shivpal from the post of the party's state unit president. Shivpal's isolation in the party is also evident from the fact that he has not been included in the list of party's star campaigners. As far as Aparna is considered, though her name as candidate from Lucknow Cantt seat was announced by Shivpal as the state unit president, it was missing from the list of candidates announced initially by the new SP state president Naresh Uttam. She, however, found favour later and was announced as candidate and has also earned support publicly with Akhilesh's wife Dimple coming out in her favour at an election meeting yesterday. 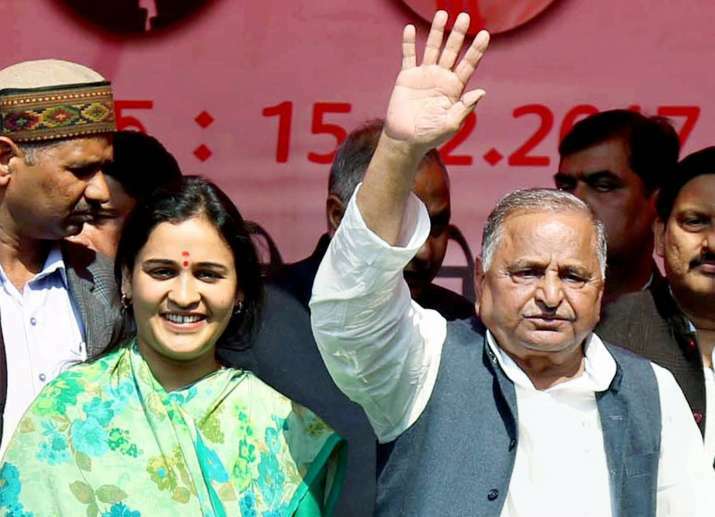 Mulayam, who was against the SP-Congress alliance, had initially declined to campaign in the polls but relented after a flip-flop in the wake of SP-Congress alliance, which he did not like. He has, however, not spoken strongly in Akhilesh's support and has instead concentrated on the SP government's works and promises fulfilled by it.